Mrs. Carol has done it again. What a wonderful yet exciting story that will keep you turning the pages, while wondering what is going to happen next. Without giving away any spoiler's, Mrs. Carol's book is full of mystery and surprises along the way. Personally, it felt as if i was on a thrill ride , yet hanging on to the edge of my seat wondering what each character's were going to do next. I loved reading this book and so will you, especially if you like suspense and mysteries. Tammi Jean Cook is sixteen. She is also psychic. So when Tammi Jean hitches a ride from a long-haul trucker named Elvis P. Boone, she knows that when she reaches California she’s going to find her daddy . . . even though everyone claims he’s dead. As they travel from the kudzu-choked fields of Alabama to the scenic hills of California, Tammi Jean and Elvis become friends as the miles click by on the Kenworth’s odometer. They also encounter people like a young woman fleeing for her life; an old Cherokee woman, who warns Tammi Jean of the risks in knowing anyone’s destiny; and a man with frightening plans for one innocent child’s future. There’s also the Man-in-Black. 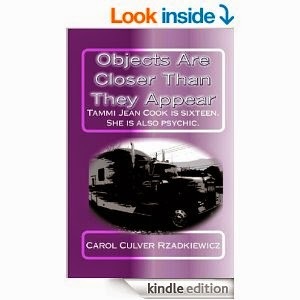 Another long-haul trucker, he too is headed for California; and along the way he challenges Tammi Jean to explore the darker side of being psychic.